What in the name of Redmond is killing the PC? The word on the street is that smartphones and tablets are responsible. Another theory posits that Microsoft’s craptastically unfocussed Windows 8, neither fully touch nor fully desktop, is mostly to blame. Surely those things play a role, yet the aging and still capable Mac or PC on your desk is perhaps a bigger part of the problem. First off, Windows PC sales have tumbled by double-digits quarter after quarter. First quarter Mac sales estimates range from 7 percent down to 14 percent up, a controversy that Apple will settle conclusively on Tuesday, April 23 when it reports results. That said, with nearly four in 10 Windows users still using Windows XP and only 3.17 percent have adopted Windows 8, a simple fact of life is that people are generally quite happy with their old PCs. 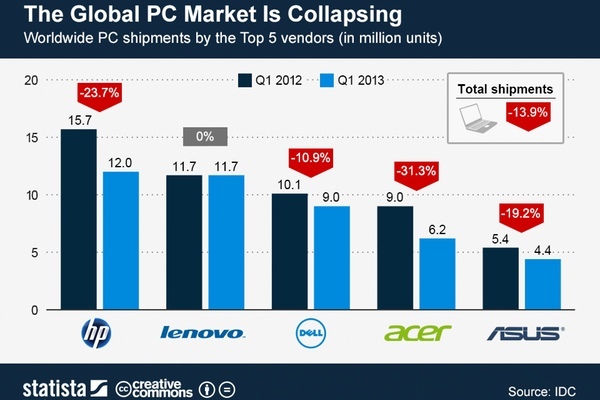 That makes for tough sledding for Microsoft and PC makers, like HP and Dell. For what it’s worth, the “PC” on my desk is a 2007 iMac, which runs OS X 10.8 Mountain Lion, the latest version, just fine. That said, I’m typing this on an iPad 3. Yes, Windows 8 is an an abject failure. And, yes, smartphones and tablets are increasingly capable, and siphoning away users. However, a large number of users, including moi, just don’t feel the need to buy a new PC. Killing the PC? Hardly, our PCs are doing just fine. Are you planning to buy a new computer? Why or why not?